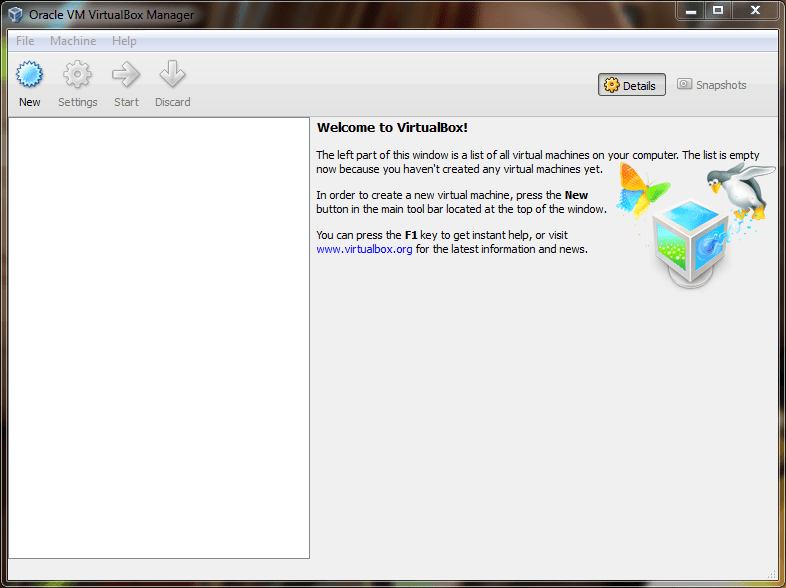 For most users, the default settings with Virtual Box will work fine. When we go to install Ubuntu, there should be some presets that we use that will basically fine-tune everything for us, making this process much simpler. The next thing we should grab is the Ubuntu ISO file. 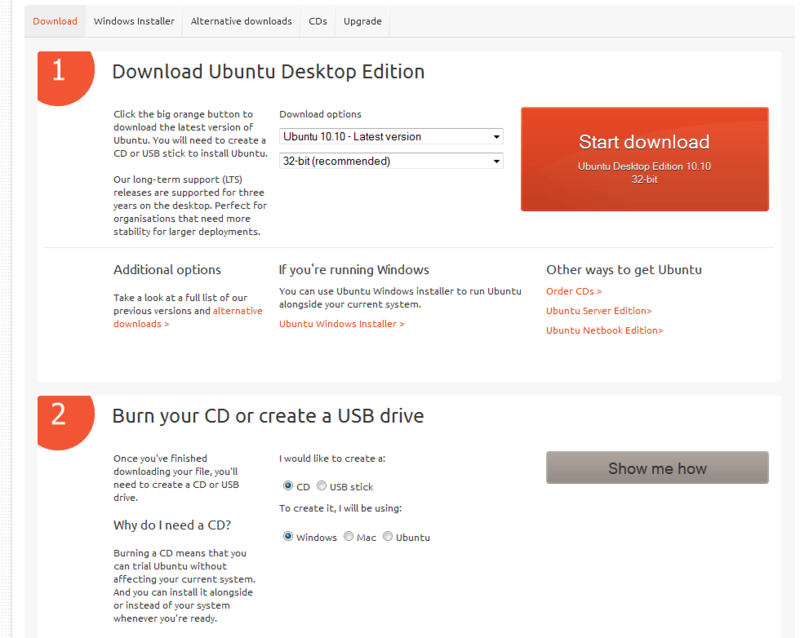 Head over to http://www.ubuntu.com/desktop/get-ubuntu/download and grab the 32-bit version of Ubuntu. Don’t worry about creating a CD installer just yet; Virtual Box can accept ISO inputs through a Virtual CD Drive that is uses to install many operating systems as well as applications. The file size is about 700 megabytes so it shouldn’t take too long to download. Once you have everything downloaded and have Virtual Box installed, we can finally get to the fun part: installing Ubuntu inside of your Windows machine! someone want to give me the skinny? Another tip. It will by default only give you an 800×600 virtual screen. To increase that, start Ubuntu in the Virtual machine, and then select the menu item in the virtual window (not in Ubuntu) Devices>Install Guest additions. This mounts a virtual CD in Ubuntu, which you can auto run. This installs some extra stuff in Ubuntu. Restart Ubuntu, and you will have a larger screen. Thanks Steven for your input! When I went to boot up the Virtual Machine for the first time after Ubuntu was installed, I never had a problem with it wanting to install again. It is a great idea however just to make sure that you don’t mess anything up. Glad to see the article was of use to you! Thanks for this, it really got me started, and works a treat. One thing you have to do after running it the first time is change the boot order on the virtual machine, otherwise the install Ubuntu dialogue will come up each time. To do this, go to Settings>System>Boot order. You can just un-check “CD/DVD ROM”, and from then on it will boot from the virtual HD instead of the virtual Ubuntu CD. I have found that having a virtual linux installation makes available all the greatness of linux while allowing you to still have a user friendly OS (not to incite a flame war or anything). I once used a virtual linux installation with 10 NICs and 4 extra vnics per NIC because there were 5 gateways to link through. Why would I do this? The apt complex I lived in had a 100kb/s speed cap per IP. Quick, what is 10 NICs time 5 Gateways? The answer is 50 IPs. What is 50 * 100kb/s? A 5 MEGABYTE PER SECOND TUBE for massive torrenting greatness. Bandwidth aggregation aside, it definitely has its uses as far as development is concerned. Having both Windows and Linux available is a uniquely useful combination in the right situation.